Viewing only articles tagged with "Kingdom Hearts χ[chi]". Kingdom Hearts Unchained X[chi], the mobile port of the browser game Kingdom Hearts X[chi], will be available for Japanese iOS and Android users to download from the App Store and Google Play this Thursday at 12:00 p.m. local time. With the Japanese version releasing so soon, this hopefully means the international version isn't too far from being released as well. In other Unchained X[chi] news, the game has been confirmed to make an appearance at this year's Tokyo Game Show (however, Kingdom Hearts III is not part Square-Enix's TGS lineup this year). Happy 2nd Anniversary Kingdom Hearts Chi! Reaching it's two year point, the Japanese browser game is still going strong. 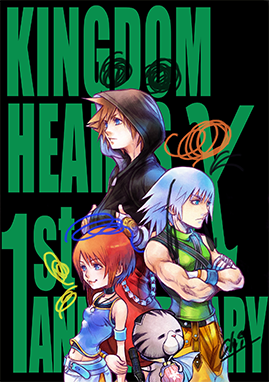 In celebration of it's anniversary, Nomura released a nice little piece of artwork that features Sora, Kairi, Roxas, and Namine in some colorful clothes swapping. Below lies the artwork for the last two years. For those still hoping to play the game, the mobile version, is well into development. It's E3 trailer can be viewed here. Finally, new information has been revealed during E3 2015. We see Sora with a new outfit and in regards to the illustration style, I think the direction with the ‘Kingdom Shader’ has been refined. Nomura: It became substantial enough for me to be able to show it. However, in regards to each world in Kingdom Hearts, the shader may be different and they will be adjusted accordingly. In the trailer, Young Xehanort and Young Eraqus appeared. With the conversation being heard before, it looks like it takes place in the beginning of KH3. Nomura: Yes. It starts at the beginning. You can see that a part of the conversation foreshadows the future. While Young Xehanort has appeared in Kingdom Hearts 3D, this conversation took place before those events. Since Eraqus is younger than Xehanort, he is somewhat childish. These two were under the apprenticeship of their Master as Keyblade wielders. From what we have seen in Kingdom Hearts 3D, it seems Sora and his friends are gathering the Guardians of Light? Nomura: It will be something like that. Sora and his friends are going on a new journey, immediately after Kingdom Hearts 3D. Also, in Kingdom Hearts χ[chi] and Kingdom Hearts Unchained χ[chi], it will begin to significantly involve Sora’s fate. So immediately after Kingdom Hearts 3D. I definitely won’t miss out on KINGDOM HEARTS χ[chi] and Kingdom Hearts Unchained χ[chi]. The new world that contains Rapunzel’s tower has received great feedback at E3. Nomura: The Osaka development team wants to challenge themselves with Rapunzel’s hair. They are saying they want to use her hair for combat and it seems that the creators of Rapunzel are acknowledging our efforts. A Disney creator endorsed it! Nomura: Previously, I was dealing with classic works. This time, I have adopted a relatively new work. It’s so I can directly see the people who have been involved in that series. There are many times we have exchanged words while producing it so it can be represented more accurately. Other than the new world for Rapunzel, what other new worlds are there? Nomura: Wait for more information in the future. There are a number of worlds that will delight everyone. Please look forward to it. We would like to ask you about the action. In the trailer, battles scenes are quite flashy and more bolder than the ones in Kingdom Hearts 3D. It left me an impression that I will really enjoy it. Nomura: As an action game there is much more you'd want to do. You can move seamlessly in the map, and you can do the flashy actions that were shown in the trailer. There were large amounts of enemies and the special effects have come out smoothly. Nomura: It’s not unusual for the implementation of free-run (laughs) There will be things that will be beyond reach with jump and free-run, traditional abilities such as glide will be there of course. I don’t know if I should be worried if their mobility is too extreme. Nomura: We have followed the base from Kingdom Hearts 3D. It certainly received opinions that there was too much freedom and difficult to control. From new found experience, it is divided into a new flow of action so we have realized this “bold action”. The system seems to have evolved. In collaboration with Donald and Goofy, it seems it’ll become part of the battle system than ever before. The enemies also show signs of cooperating with each other. Nomura: This time, we showed the three pushing back the enemies and blowing them away. Not only that, it is possible to protect yourself using this gimmick. For the enemies, when many of them appear, their AI becomes elaborate and their personality comes out heavily. Also, the different variations of the Keyblade are very eye-catching in battle. Obtaining the true power of a master, is this the reason for these sudden amazing transformations? Nomura: There will be a neat story that will explain about it. It is possible to do it in the beginning of the game. You can transform the Keyblade if conditions are met and there are several transformation stages. When Sora’s Keyblade has been changed into a particular form, you will be able to use its form specific abilities. It seems like the KH2’s Drive Forms and Keyblade transformations were merged. How many kinds of forms will there be? Nomura: It is a system that has evolved from KH2 and it is somewhat close to it. I see. For each form, it seems likely the gameplay changes. Nomura: In addition to the Keyblade transformations for Sora, it becomes possible to maneuver using specific forms and actions. There will be many battle choices. Take whatever strategy, it will be up to the player. Of course, for those who button mash will have an exhilarating experience but for those who want technical fights will also find fun making combinations. In addition to the Keyblade transformations, there is still the Attraction Flow to be appreciated. I’m surprised all these elements can be fitted. This is achieved by the large power of Unreal Engine 4? Nomura: In fact, using Unreal Engine 4, the tools and features used to make the unique representation of Kingdom Hearts has expanded greatly. So the power comes from the game’s engine you have used. Nomura: Through the expansion of the engine, we were able to elaborately devise fine and subtle expressions in motion and we are continuing to adjust this. Yes, I want to play it soon! How is the current progress of the production? Nomura: We are steadily progressing and deciding what to do with the ending… as well as considering content for the secret movie. Nomura: I’ll leave that to your imagination (laughs). Since there are still opportunities for us to publish information this year, in response to the reaction from E3, I am considering how much information I should show. It’ll be a while until it happens, please wait. 4Gamer: Thank you very much for speaking with us. At E3 2015 you released a trailer for Kingdom Hearts III, which is the first new information on it in a while, so let's start by talking about that. There were quite a lot of scenes of gameplay in this trailer, so we were finally able to see what sort of game it is shaping up to be. What are the features and points you'd like us to pay attention to for Kingdom Hearts III? Nomura: When it comes to Kingdom Hearts, that would have to be the story and the battle, wouldn't it. I still cannot say anything about the story, but there were a lot of new flashy techniques in this trailer, so I think I was able to convey that end of things. 4Gamer: There were various techniques that strongly resembled theme park attractions, weren't there? Nomura: The train, ship and tea cups and such decorated with lights are a skill called 'Attraction Flow'. There's also another feature where the Keyblade turns into things such as a chariot, or a double bow gun that transforms further and shoots magic bullets. That's a system where one Keyblade can transform into several phases, and we have created many more transformations that weren't in the trailer. 4Gamer: It sounds as though even from within the 'action' format battling has become quite varied. Nomura: On top of that there are also techniques like the 'summon' command and other abilities of Sora's, so there are quite a lot of choices when it comes to battle. There was a scene in the trailer where Sora ran up a wall to fight - that freerunning is also something you can connect techniques to for bold moves.I think that an exhilarating feel is important to battle in Kingdom Hearts, so we are making battles that you can enjoy by unleashing lots of crisp techniques. 4Gamer: Kingdom Hearts III is the first title in the series to release on PlayStation 4 or Xbox One. Are there any features you included specifically to take advantage of the new hardware? Nomura: Being able to move around flashily on large maps, like in that scene I think there is where Sora jumps off a cliff, is something we could do because of the new hardware. Up until now there have been load times when moving between areas, but now they connect seamlessly and the maps are also bigger, so you can do even flashier actions.Also, the AI during battle has been enhanced quite a bit. There was that scene where Donald and Sora are moving with Goofy has he wields his shield - you don't only execute that sort of thing yourself, Goofy and Donald can invite you into it too. On the other hand, the enemy AI is also more advanced, and we are also including the element of mutual enemies working together, so for example they can join together to charge at you and things like that. 4Gamer: Even though you weren't able to announce the release date this time, how is development coming along? Nomura: The gameplay and world assignments have been decided, and the foundations are already done, so now we are at the stage of putting our effort into all details. 4Gamer: We are looking forward to more information. Kingdom Hearts is a title that is very popular overseas. What was the reaction on-location like at E3 when the trailer was shown? Nomura: The reaction was amazing. There are so many fans overseas, I think perhaps it rivals that of Final Fantasy in popularity. 4Gamer: Why do you think Kingdom Hearts has earned so much popularity overseas? Nomura: I have no clue (laughs). 4Gamer: What an immediate reply (laughs). Nomura: I wonder why it's so popular? I think maybe the Disney look means it’s familliar and easy to feel affection towards for people overseas. But, I've spoke with people at Disney before who told me that the story of Kingdom Hearts is very Japanese. 4Gamer: Perhaps there's a feel to it that isn't in foreign games that projects appeal. Nomura: Also, it's been about thirteen years since the first Kingdom Hearts title came out, and about ten years since KH2, so I've heard quite a few people say "Kingdom Hearts was the first game I played." Perhaps these games mean a lot to fans because they are part of their childhood memories. 4Gamer: You mentioned ten years just now. Why did there end up being such a long gap between KH2 and KH3? Nomura: I personally didn't intend for so much time to pass after KHII. When people around me said it'd been ten years, I was so surprised, like, has there really been such a gap? See, I've been working on Kingdom Hearts titles this whole time. But in the midst of making spin-offs I ended up with fans saying "Another spin-off? When is KHIII coming out?" and yeah, ten years had actually passed. This is bad, I thought. 4Gamer: So that's why you decided to develop the long-awaited legitimate sequel. 4Gamer: You aren't only working on development of Kingdom Hearts III, but also Kingdom Hearts Unchained χ[chi], aren't you? Although Unchained χ[chi] is set the furthest back of any game in the series, it connects to KH3. How does that work? Nomura: In the world of Kingdom Hearts so far the phrase 'Keyblade War' has come up a few times, which refers to a legend regarding a huge war fought between Keyblade Wielders. Even in the trailer we just released for Kingdom Hearts III, those two boys are talking about the Keyblade War. The world of Unchained χ[chi] is set during the age just before that war. If you play Unchained χ[chi] you will enjoy KH3 even more, so I would by all means love for you to play it while you are waiting for KH3 to be released. 4Gamer: Unchained χ[chi] is the first title in the Kingdom Hearts series to be developed for smartphones. Are there any things you devised for smartphone use? Nomura: When I play social games, I hate things that are a bother. Sometimes I think, 'this could have been done with just one tap.' So, we are taking care to try and make something that won't be stressful. I especially hate getting frustrated with load times, so we in the development team have been getting passionate, going, "Fast and light! Let's aim to make the fastest game ever!" 4Gamer: With the battles of Unchained χ[chi], there's the 'one turn finish' element where you try to end battles in short turns. Is that also the result of trying to cut down on bother? Nomura: Yes, that's right. Any process that requires lots of compact operations on a little screen is going to be a bother, right? We consumer developers end up wanting to keep fiddling with things. In the beginning I was actually thinking of going with an even more different combat system, like fighting by tapping in time or something like that. But that was stupid (laughs). 4Gamer: It seems that polishing your tactics in the opening setup and thinking of how to defeat the enemy in one turn for points will be a fun part of battling. Nomura: Before, there have been times when I played other smartphone games and thought, "where is the catharsis (for the players) meant to come from?" And then, the bit that made me think "from here!" was when you did something and points started increasing with incredible vigor. When it comes to the operation, it's important to get a response that feels good.From the beginning, in Kingdom Hearts we directed it so that when you defeat enemies prizes come bursting out, and we wanted to translate that kind of good response into a smartphone game. So then, the good feeling from one-shotting an enemy with a one turn finish is incorporated as one of the charms of the battles of Unchained χ[chi]. Credit to goldpanner for the translated interview. Is Square-Enix Germany Hinting at Possible Localization of X[chi]? For anyone following the currently Japanese exclusive free-to-play game Kingdom Hearts X[chi], the above image will look familiar, as it's taken straight from the game. What's more curious is the caption they added, which roughly translates to "What is going on with the post? Just so, this had to be said." Is this a sign that X[chi] may finally be released internationally?